Here is more to do with those gorgeous tiny tomatoes that are so abundant and sweet at this time of year! My version is lovely summer fare – bright and sweet and yet with depth. It also requires very little work and I did it successfully in the toaster oven, limiting the heat index in my kitchen! You can serve it on crusty bread or over pasta, but I popped a fair few into my mouth just as they were…. Preheat oven to 300°F. 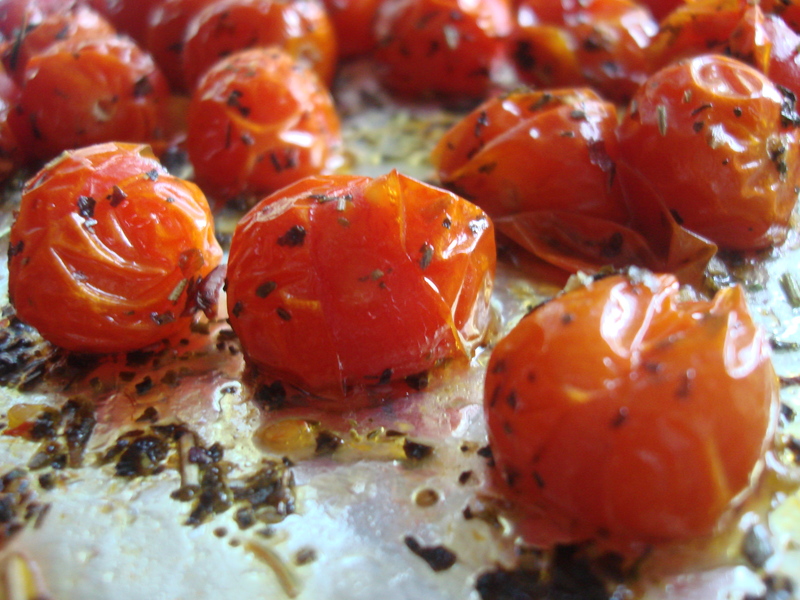 Line an oven dish with aluminum foil and spread tomatoes in a single layer. Sprinkle with sugar and salt, then coat with olive oil. Sprinkle with herbs and roast for about 30 minutes, so that tomato skins are crinkling and splitting, but not fallen apart. Cool and serve on garlicky toast as bruschetta, as sandwich spread or mixed into hot pasta. Our tomatoes, which are similar to these, are about to ripen. This is a good way too use them. They look really nice.